Trying my patience: Urban Trial Freestyle review. Dirt bikes are rad. It’s not hard to sell people on the concept of a dirt bike. It’s a motorcycle that you can drive in the mud! What’s not to love? It shouldn’t be hard to make this kind of game fun; Excitebike did it in 1985. So then why does Urban Trial Freestyle frustrate me so much? The opening sequence is all over the place. You hear cops on a radio talking about a rougue biker, then you see Shirtless McGee here being filmed on someone’s camcorder. Suddenly the rest of the McGee clan rides by on their bikes and snapshots of them doing cool tricks are followed by the words: Chase It, Push It, Feel It, Nail It, (Bop It?) and then the command to “Take The City”. The intro ends with Shirtless killing the camcorder guy with a street sign. Well, maybe he isn’t dead, but he did take a nasty hit. After that over the top lead in I thought that this would play like a mix of Grand Theft Auto and Tony Hawk, and boy was I wrong. 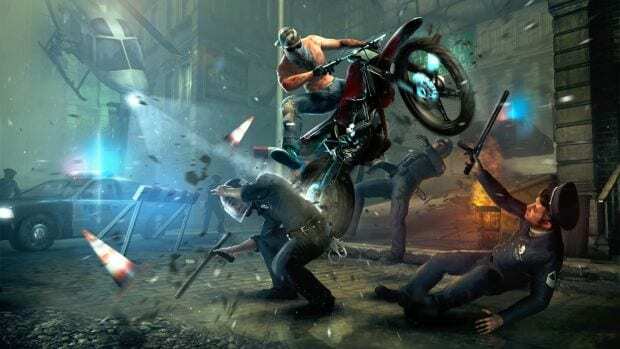 Urban Trial Freestyle is a side scrolling, dirt bike platformer, which does sound pretty cool. What is missing from the equation is any concept of “freestyle.” The game only has two modes, time trial and trick attack. Time trial is just a simple race, though they did add the ghost of the person with the best score to race against. Trick attack, however, is a huge disappointment. You can only do four tricks; High Jump, Speed Check, Flip Meter, and Precise Landing. You may only do those tricks in the designated “trick zone”, eliminating any “freestyle” from the equation. If I could do tricks wherever I wanted the game would be about exploring the levels and seeing where I could get the best trick to point ratio. Instead I just kept restarting at checkpoints before the “trick zones” when I didn’t get a high enough score. Plus, the game only uses four inputs on the controller, so you can’t tell me adding more trick variation is impossible. Throttle, brake and balance are your tools to keep this guy on the track. It sounds simple enough, except for the extra bouncy physics and the extremely touchy throttle that will fight you every step of the way. Fine control is incredibly difficult, even with upgrades. Popping a wheelie is required to get on to ramps or over obstacles, but the left stick feels so mushy that keeping the bike from flipping over is a skill on its own. A single button press will restart you from your last checkpoint, so hope that you don’t accidently hit it right before you cross the finish line. Oh, and restarting doesn’t reset the timer, so have fun ruining your score. Most of the challenge comes from the level design, but not in a good way. The platforming elements are so hard and out of the blue that the only way to get past them is through trial and error. While some games use repetition well, Urban Trials Freestyle’s difficulty is cheap and unforgiving. I’m not kidding when I say that it took me ten tries to get that bike up a ramp and then stop in an open ended elevator. Many of these platforming elements felt like they should have been special challenges for the truly die hard player, not a set piece in a level. The level progression is all over the place. Each level will reward you with up to five stars depending on your skill, and the more stars you have the more levels are available. But the game doesn’t make you finish a world before moving on to the next, so you end up having to backtrack to get enough stars to keep going. If you can’t manage to shave a few seconds off a lap, or land a few more flips, you’re stuck. The upgrade system feels very linear. Buying a bigger engine is the most noticeable improvement, and seems necessary for getting through some of the later levels. The chassis and wheels are supposed to help with handling, but any improvement isn’t apparent. There are some vanity items that you can buy, like a t-shirt. Ironically the most expensive outfit is a proper motocross suit, complete with helmet. Urban Trial Freestyle looks douchey and unpolished. The soundtrack gets old fast, the character models are too shiny, your stupid bandanna will clip through your stupid chest, and your bike will get caught on the most random objects on the track. It gets so difficult, and the progression is so odd, that I couldn’t even finish the game. You can only try to maneuver a dirt bike through pneumatic platforms that launch you from one to another, up a shaft, so many times before admitting defeat.